Fast radio bursts, or FRBs, are a source of endless fascination. But despite a decade of observations, not all astronomers are sure that they’re real. A study out in Nature today, which reports the very first recurring FRB, may cause lingering skepticism to evaporate. And Williams is not one to take splashy new claims about FRBs—high energy radio pulses of unknown origin, which flit across the sky for a fraction of a second—lightly. In fact, he’s spent the last week raising major doubts about another recent study, which, as Gizmodo and other outlets reported, claimed to have pinpointed the location of an FRB in space for the first time. Hessels’ team obtained additional observations last spring, and were amazed to discover not just one or two, but ten additional radio bursts. These bursts occurred in the same patch of sky, and had the same “dispersion measure”—a metric that tells astronomers how far radio waves have traveled to reach our receivers. “This unambiguously identifies FRB 121102 as repeating,” Hessels and his co-authors write. And that, in turn, has big implications for what could be causing the mysterious energy bursts, which have been attributed to everything from pulsars to merging neutron stars to supernovae. “The other really weird thing about the repeat bursts is that they have very different spectra,” he added. So, we’re looking at a high energy and highly variable pulse that occurs at seemingly random intervals. What could be causing such an event? Hessels and his co-authors discuss one intriguing possibility: an insanely dense, rapidly rotating dead star with a magnetic field a thousand trillion times greater than the one you’re sitting in right now. Called a magnetar, this is a very special and exotic type of neutron star. If you were foolish enough to approach one in a spaceship, it’d stretch every atom in your body into a pencil-shaped rod. According to Hessels, it’s plausible that “starquakes”—rapid reconfigurations in a neutron star’s magnetic field—could be behind the exceptional signal. Before they can be certain, Hessels and his team need to figure out exactly where in space the FRBs are coming from.“If we can localize the signal to another galaxy and get an idea of the distance, then we really know how much energy is involved,” he said. 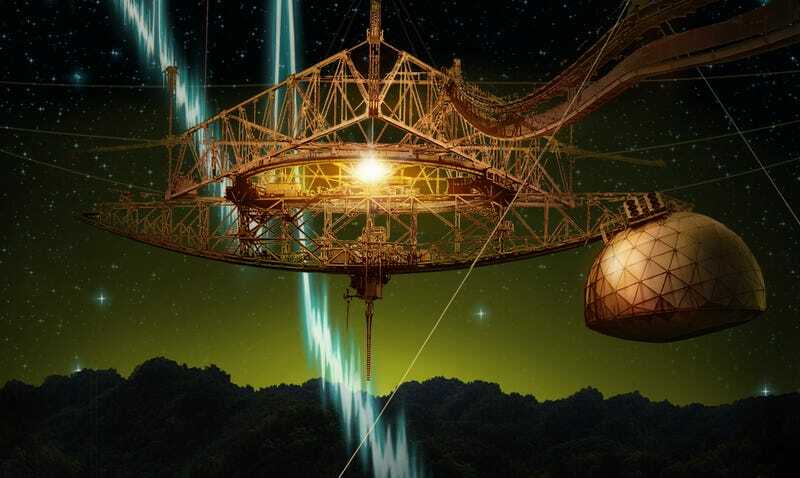 But nailing down the location of an FRB is no easy task, which brings us to the radio burst study published last week in Nature, which claims to have done so for the first time, linking FRB 150418 to a quiescent galaxy located six billion light years away. Unfortunately, the team’s conclusions started to unravel over the weekend, when Williams, along with Harvard astronomer Edo Berger, found new evidence that they argue invalidate any associations between FRB 150418 and this particular location. (Much more on Williams’ new findings here.) “I’m reluctant to say we’ve debunked it yet, but I think we’ve raised questions,” Williams said. However the latest controversy shakes out, both Keane and Hessels’ studies underscore the challenges associated with trying to understand fleeting cosmic signals. But this is the scientific process, in all of its messy glory. Perhaps it’ll turn out that there are many different celestial phenomena—from the furious quakes of giant cosmic magnets to colliding stars—behind these elusive energy pulses. I personally can’t wait to see what we discover.